Apameia in Phrygia. ca. 133 to 48 BC. AE 23. Reference : SNG COP 184. Size : 20.8 x 22.8 mm. Weight : 8.60 grams. Grade : gVF, with a very dark dark brown patina, but I suspect the coin has at one time be stripped and retoned. Looks nicer than the image suggests. Obverse : Head of Athen right, wearing a Corinthian helmet. 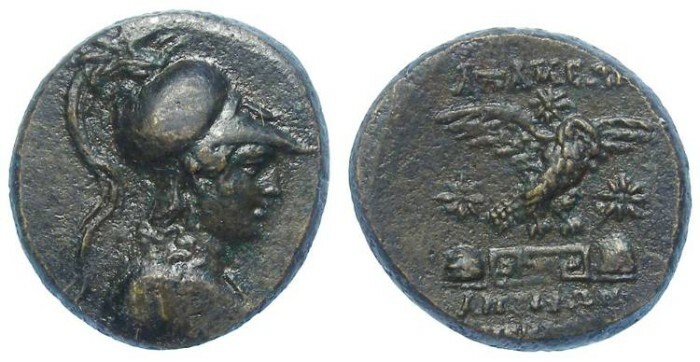 Reverse : Eagle surrounded by three stars, about to alite on a Meander pattern between two caps of the Dioskouroi, withh APAMEWN above, with an uncertain magistrates name below (the letters are weakly struck, and I have not yet been able to read them).